To reinforce the braking force of the service (foot) brake. Only new drivers use the auxiliary brake. To assist the driver when he begins driving on a steep uphill climb only. To secure his vehicle from any movement. What risk is a driver facing while making a right turn? 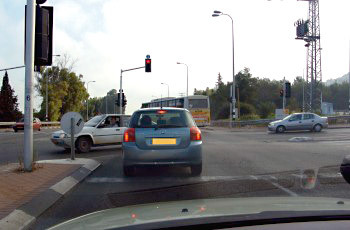 There is no risk because all road users are aware of the law and know that it is prohibited to be on the right side of a vehicle that makes a right turn. There is no problem because pedestrians and two-wheeler drivers should not enter into a gap created on the right of a vehicle that makes a right turn. 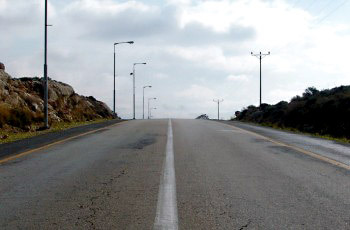 There is no risk during the turn, because the law permits two-wheelers and other vehicles to turn at the same time. Two-wheelers might enter the gap to his right during the turn. What effective solution for tiredness is available to the driver? Turning on the fog lights. Adjusting the speed to his level of tiredness (driving slower the more tired he is). Turning on the wipers and solving a cryptic crossword. How should a driver conduct himself if one of his tires punctures while driving? Release his grip of the steering wheel and gradually brake the vehicle. Hold the steering wheel firmly and gradually brake the vehicle. Release his grip of the steering wheel and strongly brake the vehicle. Hold the steering wheel firmly and strongly brake the vehicle. What is the proven and recommended method for keeping proper distance from the vehicle driving in front of us? Drive as similarly as possible to the drivers in the adjacent right and left lanes,. Vehicle length and engine volume method. 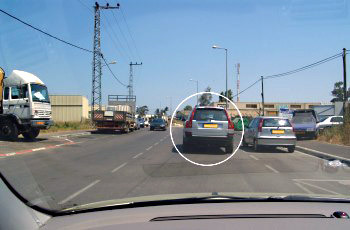 Estimating a reasonable distance between yourself and the vehicle driving in front. Only contributes in a theoretical level, and has no other advantage. Allows the driver to operate them automatically, without thinking. Allows the driver to fully concentrate on the traffic and the road. Allows the driver to blindly operate the vehicle systems. There is no advantage in keeping to the right side while driving. It is easier to see the incoming traffic from your opposite direction. It allows an increased response time while overtaking. What should you do when your driving lane is blocked by the double-parked silver vehicle (marked with a circle)? Slow down, allow the vehicle coming from the opposite direction to pass undisturbed, and then overtake the parked vehicle. Stop behind the silver vehicle and wait for a policeman or an inspector. Overtake the silver vehicle through the gap between it and the vehicle coming from the opposite direction. Go to a higher gear to complete the gradient quickly. 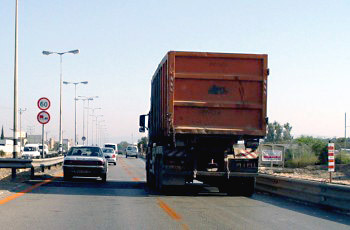 What are you required to do when the truck in the picture enters your driving lane? Allow it to enter the lane without disturbance. You should stay on the left lane and drive faster. You should drive faster and prevent it from entering. You should move to the right lane in order to continue driving. The higher is the vehicle’s stability on wet roads. 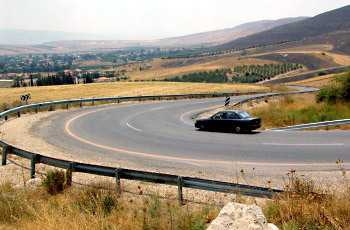 The lesser is the vehicle’s stability in turns and curves. The higher is the vehicle’s stability in curves. What are the preliminary actions a driver must perform while getting back up to the road from the “hard shoulder”? Observing all traffic on the road, signaling appropriately and gradually moving back on the road. Signaling appropriately and getting back to the road as quickly as possible. Getting back to the road diagonally, as quickly as possible.. Putting the vehicle in a diagonal position and turning on the vehicle’s distress lights. Which vehicles must be equipped with a fire extinguisher? All motor vehicles, except for private passenger cars, tractors and motorcycles. Is it permitted? Will I manage to complete it safely, without any doubt?. Does the road have a “hard shoulder”. Does the insurance cover the damages in case of an accident? What is the penalty for prohibited overtaking? When is it permitted to perform an emergency stop? After signaling a distress sign to the vehicle behind you only. 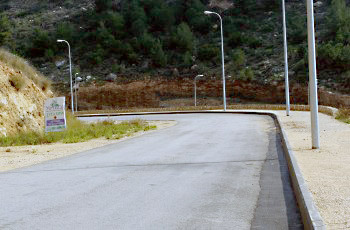 In order to prevent a road accident that cannot be prevented in any other way. When the driving speed doesn’t fit with the road conditions. When the road is distorted.